Caused in part by a greater emphasis placed on cost containment and reducing unnecessary admissions, there has been a shift in volume from inpatient to outpatient care. As outpatient volumes continue to grow, planning for this shift is paramount to a hospital’s and healthcare system’s success. 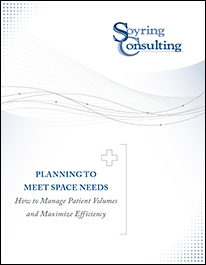 Download Soyring Consulting’s free white paper to help answer this: Are you using the space you have in an optimum way, and how do you plan for the future? In addition to practical strategies, this resource contains steps to analyze your facility's status, including market studies, an operational audit, peer comparisons, and where to turn for assistance--all accompanied by sample data tables.